Recently, I was speaking with a former student who had graduated a few years ago. In our conversation, he said that he wished that there was a band that he could play with in near his home. I mentioned to him that there were some groups in his area and that if he was still interested in playing that all he needs to do is go to the rehearsals. Go online and search for a community band/orchestra/chorus. It takes almost no time. Every group is a little different with what experience level they are looking for. For example, one group may be open to all players while another may ask for adults only. These kind of requests may affect what kind of music is performed with that group, so it is important to do your research. The important thing is to always show up prepared. 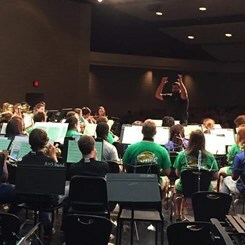 Rehearsals are for the ensemble, not individual practice. After all, most groups only rehearse once a week. Also consider that the more professional the group, the more likely you may have to audition for a position. That means you need to be up on your playing. Most groups that require an audition will post requirements and audition materials on their websites or will provide you with a point of contact. As always, remember that if you have any questions about instruments or music, feel free to contact us here at Music & Arts.